Welcome good gentiles, one and all! Verily my name beith Pennywise, and serve I do as jester at the court of thine king. Cometh and watch as I prance about and sing songs for the joyous pleasure of mine sire. Forasmuch as my sires will, I will make merry for thy pleasure, with not a few tales of bawdy desire. So hearken unto my words as I tell the tale to bring joyous tittilation to thy soul. Oh man....That would be spooky. Just think if Pennywise had been a court jester in medieval England. Then again.....at the rate of child mortality during that period, I suppose a serial killing alien spider-clown would hardly have been noticed. All right, let's just get to todays subject. I'm in a hurry anyway. You see, they just released Torchlight 2 for the Mac on Monday. I found out last night and had to download the client. And as soon as I'm done with this post, I'll be hacking and slashing my way to insensibility. But first, I have a duty. And that duty is to tell you today is Totally Trippy Theory Thursday. I tell you about a conspiracy theory that real people really believe. Well, QEI took the throne when her father died. She was 25 at the time. Or was she? This is a conspiracy theory, remember. The truth, according to the theory, is Elizabeth never took the throne. She couldn't She died 15 years earlier from either a fever or the plague. The story is, he father was on his way to visit her when she died. And Henry VIII was a mean mother. He was already in a bad mood because not only was he fat and crammed into a small carriage for the trip, he had sores on his posterier that were starting to fester. So finding out his favorite daughter had died would set him off. So her hand maiden and her tutor decided it was in their best interests to hide her death from Henry. So before the king showed up, they searched high and low for a small female child that they could pass off as Beth. But alas, there was no joy in Mudville that night. So they did the next best thing; They picked a small boy and stuffed him in Beths clothes. They then explained to the boy exactly why it would be in his best interests to play along. You see, the crime of allowing a royal child to die while under your care was considered treason. And at the time, the punishment for that was the famed Drawing and Quartering. You know, they hang you by the neck until you start to pass out, then they tie you to 4 horses, one each arm and leg, and before whipping the horses, they slice open the belly and place large handfulls of your guts on your chest. Then they make the horses charge until they pull you into 4 separate pieces, which they then send to the four corners of the kingdom as an example of what happens to people who cross the king. So, little whatever his name used to be impersonated Beth. And he got away with it. For sixty years. Now, the supporters of this theory offer up proof. 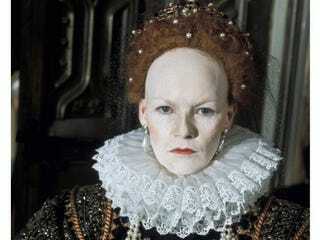 Queen Elizabeth I never got married. Need more proof? One of her tutors, (not the same one who did the old switcheroo), commented that her mind was sharp and quick, like a mans. Um....and let's see....nope. That's about it. That's their proof. She never got married and she was too smart to be a woman. All right. I think I covered everything. Now, if you'll excuse me, I have all sorts of dungeon monsters to go kill.